I wanted to hold off writing this post, because I wanted to be impartial to the product as possible. However, when I first installed Telerik’s JustCode, I instantly knew that this was the productivity enhancement tool for me. Let me back up a little, over the years I have given ReSharper and CodeRush more than enough latitude to impress me and after using them for 3 months or more at a time I always end up just uninstalling them. And I constantly repeated this process over and over again, start with naked Visual Studio, get antsy want to try something new install ReSharper, get fed up, uninstall, install CodeRush, get fed up, uninstall, repeat. Performance, JustCode doesn’t slow down the startup process of Visual Studio, and it doesn’t slow down the performance of Visual Studio while using it. The power options aren’t hidden way behind obscure keyboard commands. The first 3 points above are superficial and hard to prove in a blog post. However the 4 point is very easy to explain. My problem with CodeRush and ReSharper is that unless you had inside knowledge or a ton of time to spend learning all the ins and outs of the software you pretty much started and stayed at a disadvantage. Just to be clear, I have spent countless hours watching the video's, reading blogs, and slowly finding all the ins and outs of each productivity tool, and to be honest it shouldn't be this hard. And I should following up to saying it doesn't have to be this hard. C – Create, for generating and creating related code. R – Refactor for refactoring the current code. N – Navigating the project. Under each of these menus is a context sensitive menu for all the options available to you to create, refactor, navigate, and sometimes test your code that you are hovering over. All this being said, if you have the time and the inclination to learn the keyboard commands, you should, because it just adds a speed component to the same productivity you have by clicking around with the mouse. The other great thing about the JustCode approach is that it is not totally in your face always reminding you that you are running JustCode such as CodeRush and ReSharper do. Maybe this is a bad marketing decision to not constantly remind the customer of the product they are using, but to me the out of the way approach of JustCode is a positive bonus. JustCode is essentially my friend that only pops up and says "I can help you out with that problem" when I request the help, instead of the annoying friend that is always hanging around reminding you they are there and interjecting unhelpful non-sense when you don’t need their help. 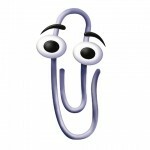 Just like Clippy did in Microsoft Office.